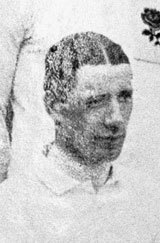 Daniel Lambert's five tries on his international debut - for England against France at Richmond in 1907 - ensured him a place in rugby history unlikely to be equalled. A big man with a good turn of speed, Lambert represented Harlequins as a three-quarter and a solid kicker and within a year of his debut had been picked by the Barbarians. His debut came in the first match against France when he was a late replacement after the original choiceon the wing pulled out. His five tries equalled the world record and would not be bettered until 1995. His reward was to be dropped by England for the remainder of the season. He was recalled in 1908 for three games - another try against France was his only try - but again he was dropped although he continued to turn in good performances for Harlequins and played in the first match at Twickenham in October 1909. The final three of his seven England caps came in 1911 and he again enjoyed the France game with another two tries (as well as five conversions and two penalties) in his only international at Twickenham. His tally in that game of 22 points remained an England record until 1990. However, the Times noted that "on one occasion Lambert was guilty of an inexcusable display of bad temper, which was not unnoticed by the spectator's". His final outing came in a defeat in Dublin. Lambert continued to play for his club up to the outbreak of World War One when he joined up. He was killed leading an advance during the Battle of Loos in 1915.